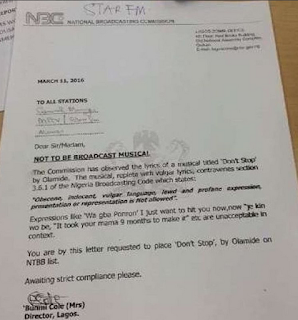 The National Broadcasting Commission (NBC) has banned another of Olamide’s song- Don’t Stop months after blacklisting his ‘Bobo’ song. According to NBC, this song also contains vulgar lyrics which isn;t good for the public. 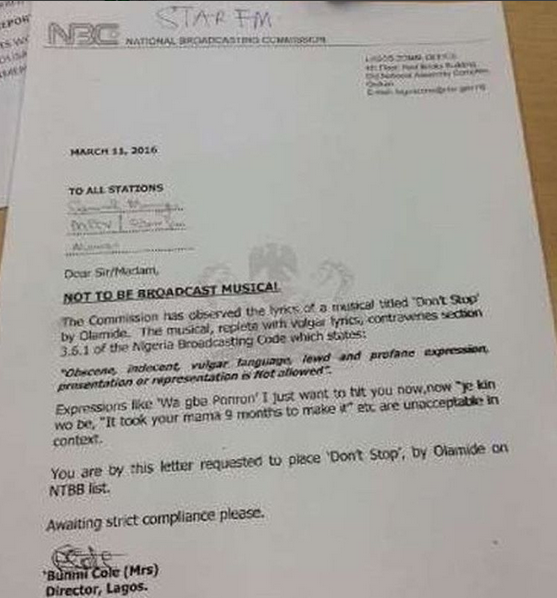 According to NBC, the phrases in the song that led to the ban includes: "I just wanna hit it now now now," "Je kin wo be (let me enter the place )," "don’t stop, take it," "Oun tami oun ro mi," "It took your mama 9 months to make it," "wa gba ponron ( come and let me give you my p*nis ). ".